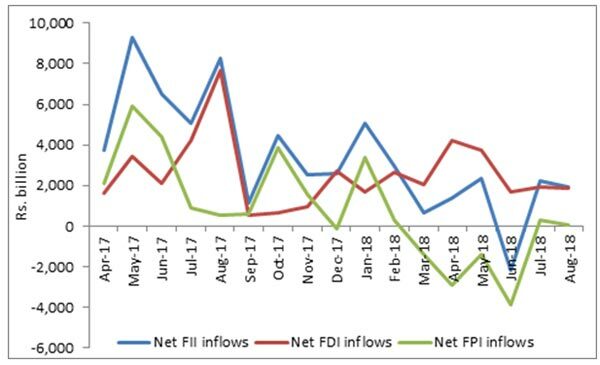 Brief: Despite net inflows turning positive since July, overall net FII has recorded the lowest accumulation in YTD terms over a three-year period.Even though, the RBI has acted positively in the open markets to shore up the depreciating Rupee through its forex reserves and engaged in infusing liquidity into the system, we continue to be remain of the current developments in this regard as Rupee continues to shed value, along with its peers. Despite net inflows turning positive since July, overall net FII has recorded the lowest accumulation in YTD terms over a three-year period. In FY19, net FII languished at $5.7 billion as of 31st August. This is substantially lower than the numbers of the previous years, when the net FII was recorded at $32.9 billion (FY18 YTD) and $20.1 billion (FY19 YTD). Net FPIs turning negative, so far this year have been the primary drivers of this decline. The number was in turn negatively impacted by the larger emerging market rout, which is responsible for massive capital outflows from markets such as India. Consequently, as of 31st August, net FPI recorded a (-) $7.8 billion as compared to very strong inflow of $13.9 billion, same time last year. We associate the FPI inflows / outflows to global sentiment, which is influenced by geo-political risk and yield chase. The hot money that was flooding the system in FY18 (due to uncertain FOMC policy) is now making its way back to its source, given the American economic recovery becoming sustainable. As further interests (Fed rate) increases become almost a certainty, the shrinking yield differentials (in debt market) and excess returns in US market (equity markets) is dictating a calibrated capital flight; a situation, ramification of which are seen in all Indian (along with other emerging market) asset classes. While the net FDI equity remained strong, being consistent with the country's internal macroeconomic stability, it could not balance out the negative sentiment built from adjusting portfolio influenced outflows. Having said that, the net FII (which is sum of FPI and FDI inflows) remained positive and that gives us confidence in the ongoing recovery in capital markets – irrespective of the high volatility plaguing the system. This also has ramifications of the exchange rate and inflationary tendencies building in the economy. Even though, the RBI has acted positively in the open markets to shore up the depreciating Rupee through its forex reserves and engaged in infusing liquidity into the system, we continue to be remain of the current developments in this regard as Rupee continues to shed value, along with its peers. Ultimately, the RBI ability to firefight the contagion will be the key as weighs in its option pertaining to the Mundell-Fleming Trilemma.